Likir Village is about 60km from Leh, Ladakh and accessible via the daily public buses from Leh’s bus station, then its a fairly easy sandy 3 – 5km walk into the village. Most tourists probably would take the day tour which combines a few gompa visits especially if they are only in Leh for a few short days. To get there on your own, its possible but buses from Leh to Likir starts from noon as the buses originate from Likir village ferrying the villagers to the Leh town in the morning before returning at noon. On return, I hitched a ride back via a jeep. It was getting dark and feeling a little anxious, I didn’t want to wait. There might have been buses on the main road if I had waited long enough. I took a chance coming here, tt was either miss the rides back to Leh, or stay overnight at the village, like what I did for other gompa visits. I arrived to Likir in later part of the afternoon, and so had to wait for the attending monk to open the doors to the main gompa for quite awhile. It was fairly a hit and miss affair but with a little wait and luck, a small group of local Ladakhis arrived for some pilgrimage trip, the monk appeared, (for the locals knew where to look for him) and open all the rooms including prayer rooms which usually would’nt have been opened for tourists. 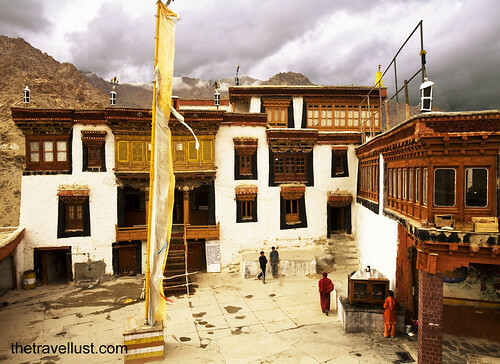 It wasn’t particularly a memorable gompa despite it being one of the oldest gompas around Leh. The rooms were fairly dark and there were no photography in the chambers belonging to the darker guardians usually called wrathful deities. There were no photography, the rules’ reason being that it was for the respect of these wrathful deities and for the safety of this photographer who might offend these powerful beings. Personally for me, I refrained from taking any photos out of the respect of the Lakdahi pilgrims I was following around. The view of the wheat colored millet fields of the Likir village was kinda pretty and that was my highlight for this place. Many other gompas I had been to, didn’t have this gorgeous view overlooking the millet fields and the the village. Likir Gompa or Monastery belongs to the Yellow Hat of Tibetan Buddhist Sect. It is more popular for its large Maitreya statue situated out in the open, behind the gompa. I failed to get any decent shots of it for you to see, as a light shower descended upon me when I was there. Besides that I was suffering from an overdose of gompas and buddhist statues for the week and so was immuned and jaded to all the beauty around me. Such is life! In the interiors of the main gompa, you might be interested in the ghostly yellow sect robes that the monks use for their cold early morning prayers. Will post those photos up when I find them. This entry was posted in 9. 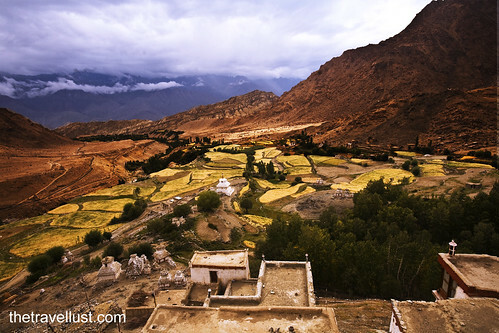 Festivals, Himalayas, India and tagged himalayas, India, Ladakh, leh, Likir Gompa Ladakh, photography, travel. Bookmark the permalink. Oh my god, followed a tweet and found your site and I.LOVE.YOUR.PHOTOS!! !